Faroe Islands, an island group between the Norwegian Sea and the North Atlantic Ocean and halfway between Great Britain and Iceland has a total land area of 540 square miles and a population of about 49,000. It has a maritime climate and enjoys clean and fresh air irrespective of the season. Fishing is the major industry followed in the distance by tourism, and woolen and manufactured products. May through September is the best time to visit the islands for then the weather is pleasant and the tourism industry is alive. Buses and ferries connect the villages and biking around is a viable option. The highest sea cliffs of Europe are located at Faroe Islands. Apart from the amazing landscapes and scenery, sailing and bird watching are the major attractions of the place. While lamb and fish are commonly consumed, whale meat and blubber, and various seabirds also make their way to Faroese cuisine. Faroe Islands Bradt Travel Guide 978-1841622248 $19 Good background information and practical information followed by region-wise coverage on Torshavn, Around Torshavn, Streymoy and the Western Islands, Eysturoy, The Northern Islands, and the Southern Islands. The first stamp of Faroe Islands is a handstamp surcharged overprint on Denmark Scott #97 released in January of 1919. The stamp (Scott #1) is very expensive and catalogs for around $1250 Mint and $350 used. This was followed by another set of five stamps issued under British administration between 1941 and 1942. These were also overprints of Denmark issues from the period. That set (Scott #2 to #6) is also sought after and catalogs for around $675 MNH and $385 used. Counterfeits of these surcharges exist and so collectors need to be careful when trying to acquire these stamps. 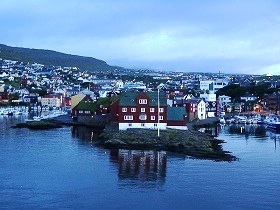 After World War II, Faroe Islands reverted to Denmark and Danish issues were used from then on until 1975. The first original issues of Faroe Islands were a long set of fourteen stamps released on January 30, 1975 showing local scenes and maps. The set (Scott #7 to #20) catalogs for around $11 MNH and $10 used. The designs show Map of Islands, Map of North Atlantic, West Coast of Sandoy, Like, View of Streymoy and Vagar, Houses by Ruth Smith, View of Hvitanes and Skalafjordur by Joensen-Mikines, and Vidoy and Svinoy by Eyvindur Mohr. A sheet of 3 stamps released on November 4, 1983 to mark the Nordic House Cultural Center opening. The sheet of three (Scott# 101a-c) catalogs for around $9 MNH or used. The design shows various national costumes with the margins showing the Scandinavian flags. Nordic House, an important cultural center in the Faroes located in Torshavn, was established in 1983 with the aim of supporting and promoting Scandinavian and Faroese culture locally and in the Nordic region. A beautiful set of two stamps and a souvenir sheet released on April 6, 1992 showing Map of North Atlantic and a Viking Ship and Map of Central Atlantic Region and one of Columbus’ ships. The set and souvenir sheet (Scott #236 to #237 and #238) catalogs for around $11 MNH or used. A set of six stamps released on May 25, 1999 showing portraits of the Northern Islands. The set (Scott #356 to #361) catalogs for around $8 MNH or used. The portraits show Kalsoy, Vidoy, Svinoy, Fugloy, Kunoy, and Bordoy. This was followed by a sister set of four stamps released on September 18, 2000. That set (Scott #383 to #386) catalogs for $9 MNH or used. The portraits show Skuvoy, Hestoy, Koltur, and Nolsoy. A set of four stamps released on June 6, 2005 in the Petrels (tube-nosed seabird) theme. The set (Scott #458 to #461) catalogs for around $15 MNH or used. The designs show two variations of Leach’s petrel (oceanodroma leucorhoa) and European storm petrel (hydrobates pelagicus). Faroe Islands use standard Danish coinage but there is opportunity for collectors to specialize in coins issued specifically for use in the Faroe Islands. Woolen knitwear from the islands is highly prized. Other collectibles include stamps and coins.